"U.S. Veterans Hospital 88, located amid the trees at 1025 Lamar Boulevard, is caring for the World War veterans who paid, with their health and strength, the price of victory. The Hospital is modern in every detail and nothing is left undone that would add tot he comfort and happiness of its inmates." The key pieces of information here are "Hospital 88" and "1025 Lamar Boulevard," because they helped with what has been a tricky building to research, in a city full of historic hospitals. 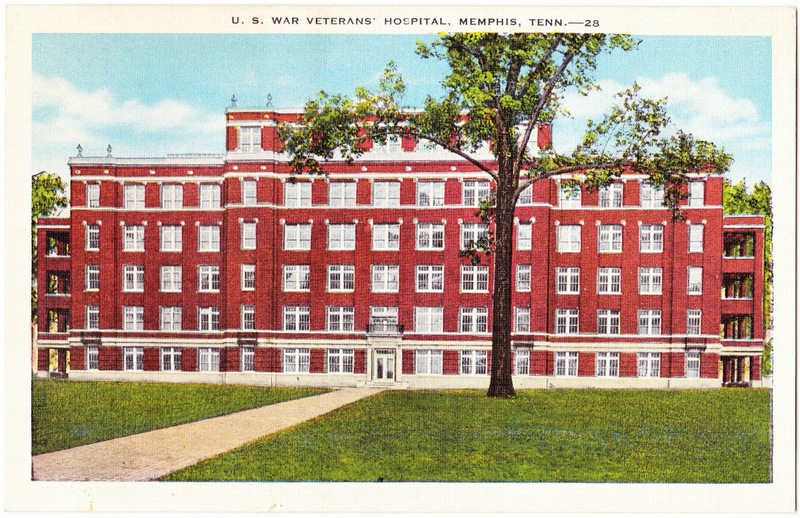 Ultimately, this postcard must date, I believe, from the period of 1921 to 1940, which is when the facility was known and operated as U.S. Veterans Hospital 88. The research breakthrough came via a fascinating 2003 Mary Cashiola article in the Memphis Flyer titled "The Mystery of the Old Hospital: Urban spelunkers turn up a mother lode of files at a former medical facility on Lamar." In 1890, wealthy Memphian W.B. Mallory built a stately home at the site. Twenty-four years later, the property was purchased for the Methodist Hospital of Memphis, a joint effort by groups in Memphis, north Mississippi, and north Arkansas. After construction was completed in the fall of 1921, the building was run as Methodist for only a scant six months before the national Veterans Administration bought it and dubbed it Veterans Hospital No. 88. The Mallory home, though later torn down, was used as the nurses' residence. According to a November 1996 issue of the Baptist Hospital publication BaptiScope, V.A. No. 88 closed in 1940 and remained unoccupied for the next 19 years: "Baptist then purchased the facility and, after an extensive renovation, opened what was called the Lamar Unit in 1962 as a chronic-disease hospital." In the late 1960s, the hospital became geared toward rehabilitation. That was written a dozen years ago. If anyone has more current information about what happened to this building, or any further details or memories of the hospital(s) to add, please share them in the Comments. This hospital was operated by the Veterans Bureau (1920-1930) before it was renamed the Veterans Administration. The number 88 indicated it was listed as the 88th hospital in the Veterans Bureau inventory. TC Mid-South Paralyzed Veterans of America Chapter Historian.